Ciliegia Villa, offers five luxurious Villas located in the only pocket desert in Canada. Nestled in the midst of the Okanagan's many orchards, with breathtaking views of Lake Osoyoos and the many hills that surround it. Our guests are invited to take in the diversity and abundance of seasonal fruits at Kambo Farms. The Villas are located just a short distance from the town of Osoyoos, this allows guests to take advantage of the many activities the town has to offer. The towns rich cultural community offers tourists; wineries where one may go wine tasting, relaxation on the beaches of Lake Osoyoos, or a fun afternoon desert golfing or boating. 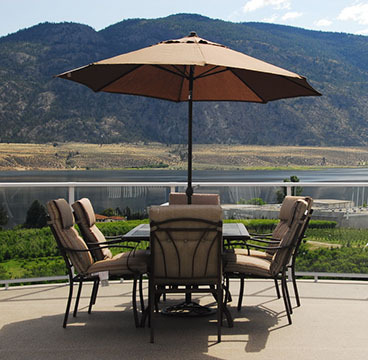 We invite you to explore Osoyoos, BC a growing tourist destination, while enjoying the privacy and luxury of Ciliegia Villa.